For the first time in nearly a half century, Whitehall is the proud home of the Section II Class D basketball champions. 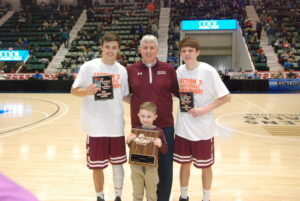 The game Saturday at Glens Falls’ Cool Insuring Arena was evenly matched, with Whitehall and St. Johnsville both hungry for a championship, but the Railroaders proved they were hungrier, beating the Wolfpack, 71-60. With the Section II Class D title secured, the Railroaders shift their gaze to the state-level of competition. Next up is the regional final, to be played on Saturday at SUNY Plattsburgh against Section VII champion Moriah, which is fresh off an 80-54 victory over Crown Point. When the action kicked off, it was anyone’s guess who would claim the title. Railroaders’ senior Evan St. Claire put up the first points of the game and the Wolfpack answered with baskets of their own. As the first quarter came to a close, Whitehall maintained a slight lead of 23-18.